How To: Hold your yoga strap with your palms facing down wider than shoulder width apart. Breathe in and take your arms overhead. Your palms will now face forward. Now arch them all the way overhead and down to your waist behind you. Repeat 5xs. Benefits: This movement with the strap will reset your shoulders so that your chest is not collapsed inward. Opening up your chest, relieving those tight chest muscles can go a long way in lessening shoulder pain. This movement will also improve the range of motion in your shoulder joints. Benefits: This will correct your posture, release tension in your neck and shoulders, lift your chest improving your breathing, improve your mood, alleviate fatigue. 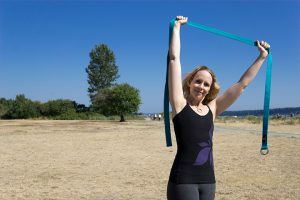 If made it all the way to the end of the video, give yourself a thumbs up and put, ¨great ways to use a yoga strap¨ in the comments. Thanks for pressing the like button, sharing this video on your socials and I will see you next week.